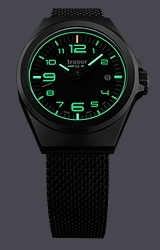 The P59 Essentials "S" Blue Watches are 37 mm Mid-Size watches from Traser, the world leader in Tritium Watches. 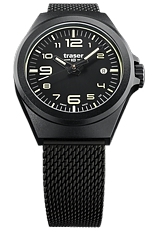 Model 108208 features the signature blue dial with a padded and stitched fine blue leather strap. 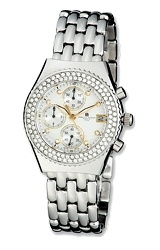 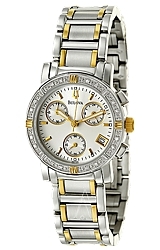 This is the perfect watch for people who prefer the traditional 37 millimeter diameter worn by both men and women. 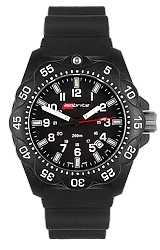 Features of this collection include an anti-reflective coated sapphire glass, fine Swiss Quartz movement for superb accuracy and amazing shock resistance, a Stainless Steel case that is water resistant to 100 meters or 330 feet below sea level and, most importantly a dial featuring a combination of Tritium and Lumibright Luminescence for great looks and all night read-ability.